Everything that could be sold was. First on the list was a ten-year-old secondhand car. It wasn’t long before the television, refrigerator, washing machine, and laptop were sold as well. Those were soon accompanied by my books and video collections, leaving only a worn-out mattress in the middle of the room. I’d have sold my body if I could, but who’d want a balding, forty-eight-year-old man? With nowhere to turn, a call from his elderly mother proves to be most timely, and before long he decides to swallow his pride and move back home. As it turns out, he’s not the only one. His elder brother Han-mo, a slightly simple layabout also known as Hammer, has been there ever since getting out of prison, but the arrival of their younger sister Mi-yeon (with her teenage daughter Min-gyeong in tow) is a surprise to everyone. All of a sudden, the dysfunctional family is back under one roof, and with a long hot summer ahead (accompanied by Hammer’s dubious bodily hygiene), things are bound to erupt. Blood may be thicker than water – but what if the blood’s not all that thick in the first place? For anyone used to stories of government abuse, exploitation of workers or (going even further back) the struggle against Japanese colonialists, Modern Family is a bit of an eye-opener. 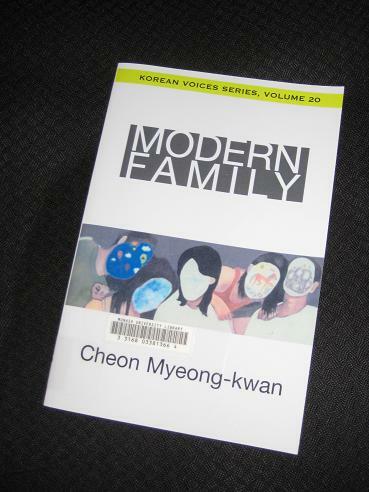 Cheon’s novel is populated by gangsters, prostitutes, bitter old ladies and teenagers with attitude, a welcome contrast to the usual po-faced literary fare. Slapstick at times, violent and disturbing at others, the best comparison I can come up with is that of Ryū Murakami, and there are definite touches here of some of the Japanese writer’s lighter works. 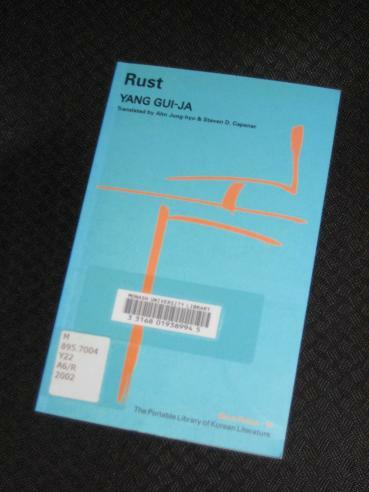 Another familiar name is Yang Gui-ja, with both Contradictions and A Distant and Beautiful Place reviewed on the blog last year. 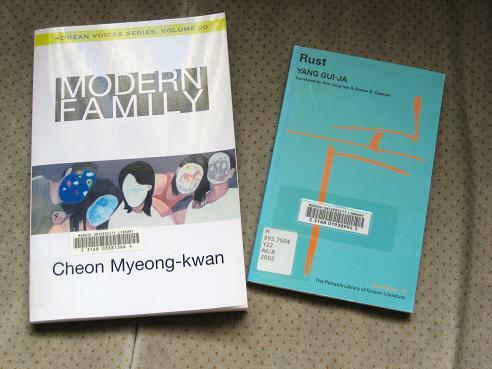 Today’s choice is a slightly shorter book, though, one of the Jimoondang series of introductions to Korean authors, this one featuring two of Yang’s stories, ‘Rust’ and ‘Swamp’. ‘Swamp’, translated by Steven D. Capener, features a well-off housewife who decides to visit an old friend, a former teacher who has retired to the country. As the two women prepare lunch and catch up on gossip, the teacher receives an unexpected phone call which changes the women’s plans. An old friend, one she hasn’t seen for twenty years, is now in the country and is waiting for her at a shop near the house. The narrator is quite happy for the man to join them for lunch, but she senses that there’s more to his visit than her friend is letting on. Only later, when they drive him to the airport, however, does the full story come out. With the story written in 1999, the twenty years ago takes us back to the late seventies, and anyone who has dabbled in K-Lit will be able to put the pieces together when told of a teacher who suddenly emigrated to the US and stayed there. Another story which touches on this theme of intellectuals falling foul of the government is O Chonghui’s ‘Lake P’aro’, but Yang’s handling of the topic is a little softer (until, that is, the final pages when we see what finally drove the teacher to leave the country…). A short piece, but well-constructed, ‘Swamp’ certainly measures up to some of Yang’s other work. Which, unfortunately, is far more than I can say for the title story, ‘Rust’. This one focuses on a man who, wanting to become a journalist, got sucked into working in magazine advertising instead. It’s a much earlier piece, and while there is some interest in the man’s struggle to cope with a job he’s not cut out for, it’s nowhere near as interesting as ‘Swamp’. To drive along the cruising lane only was very boring. They were sensitive about the parking spots, as they would have to pull out of again in less than an hour. All during this while his beige steed was asleep at a nearby parking lot, its rein tied to the pole. Makes me appreciate the beauty of Deborah Smith’s translation of Han Kang’s The Vegetarian.